The Anna's hummingbird ( Calypte anna ) is the most common hummingbird along the Pacific coast. 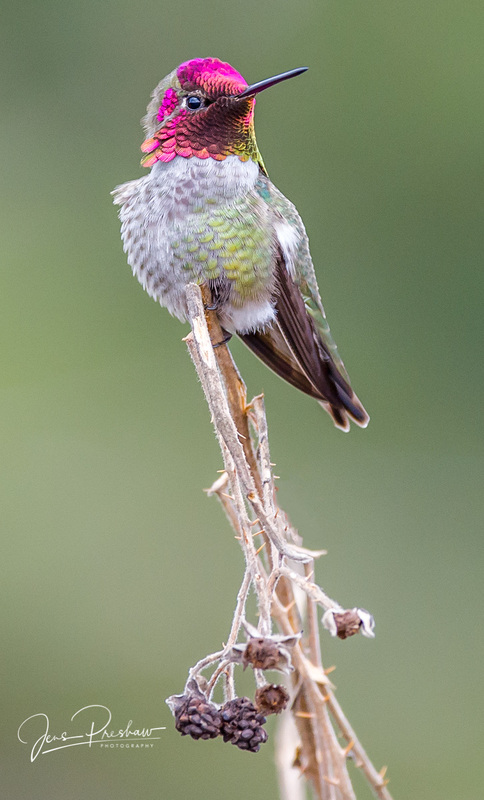 The male has iridescent emerald feathers and a sparkling rose-pink throat patch called a gorget. In their thrilling courtship displays, they climb to a height of 40 m and then swoop to the ground with a curious burst of noise that they produce through their tail feathers. The dive display lasts about 12 seconds. I have read that the heart of an Anna's hummingbird beats at 1260 beats per minute and they eat more insects than any other North American hummingbird.